Home AMG AMG GT Mercedes-AMG GT S spotted in Düsseldorf: Make some noise! It is going to make some noise whether you like it or not. But we are so sure you are going to like it. Because it is not just any noise. It is the AMG noise. The Mercedes-AMG GT S has been spotted in Dusseldorf. The video was shot by someone whose jaw dropped when he saw the car. During the video, you can hear people cheer as the Mercedes sports car passes by them. The driver holds those 510 horsepower back, patiently waiting in the traffic jam for the light to turn green. The matte-grey fireball does not come with a fly function, so it must stay in a line, just like everybody else. Other drivers stop and stare. You can’t keep a low profile in that. Once the light is green, the tailpipes roar and smoke as if the car in position for takeoff. The only setback is that the runway (meaning the German boulevard) is not clear yet. Even though its DNA bustles it to race, the car crafted by racers allows the pedestrians to cross the street, before it start off again, up to the next traffic congestion. The amateur cameraman almost loses it, but then the GT S stops again. 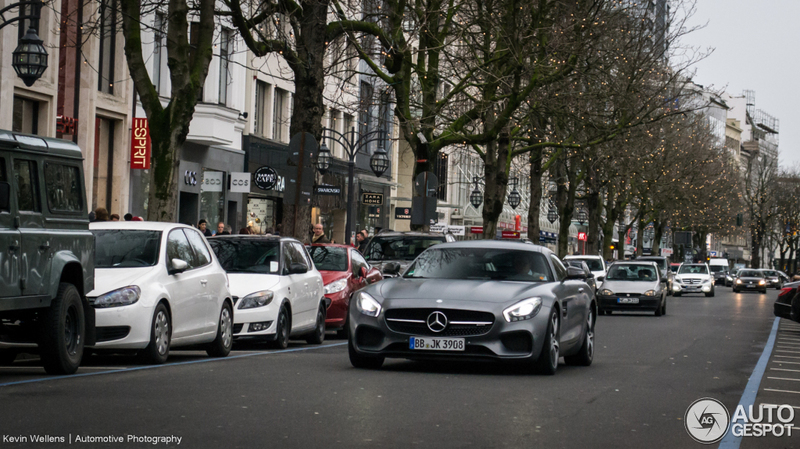 Enjoy the video of the Mercedes-AMG GT S cruising in Dusseldorf. The Mercedes-Benz Halloween. Trick or treat! Did this S-Class go through Purple Rain?